In the old days of this blog I used to go out, ride, take photos, then write an article. It was a tried and true formula, but those Halcyon Days are good and gone, at least while I’m race-pacing, hill-repeating and, of course, fartlekking towards my two Etapes du Tour this July. But that’s all about to change. Coach Rob promises many, many, many 100km+ rides to put in our legs in the upcoming month or so. In anticipation of this – and the 152 km race I’ve got next weekend – I went out for what turned into 120 km of easy-ish riding. So easy, in fact, that I attempted the wheel-side drop shot on my way out of town – with questionable results, I think you’ll agree. My ride took me west first and on at least one road that I had never ridden. Here is very pretty Logrian-Florian. Much of this route, by the way, can be found here on my website, if you’re in the area. 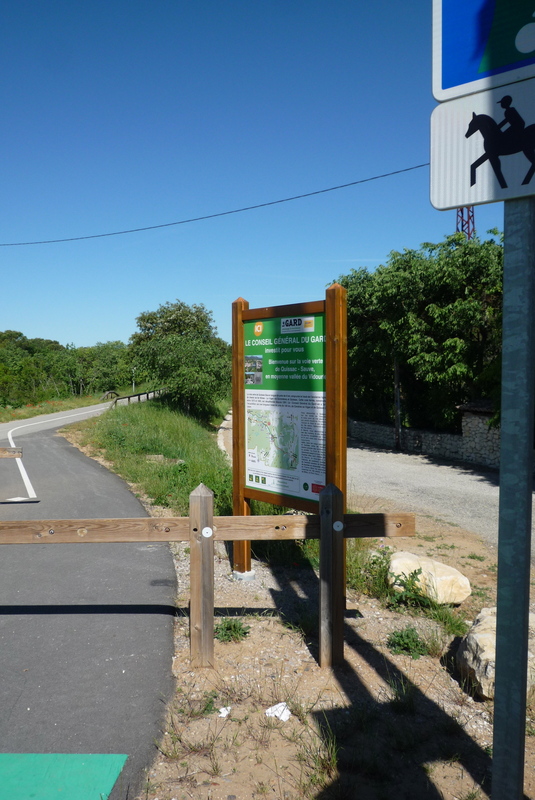 Near the equally nice town of Sauve (present home of Robert Crumb, for comic lovers out there), I re-discovered a section of the voie verte (greenway) that will someday, maybe, run from close to my home all the way to Le Vigan, a hundred kilometers or more away. This section, which almost makes you wonder why they bothered, is around 6km long. 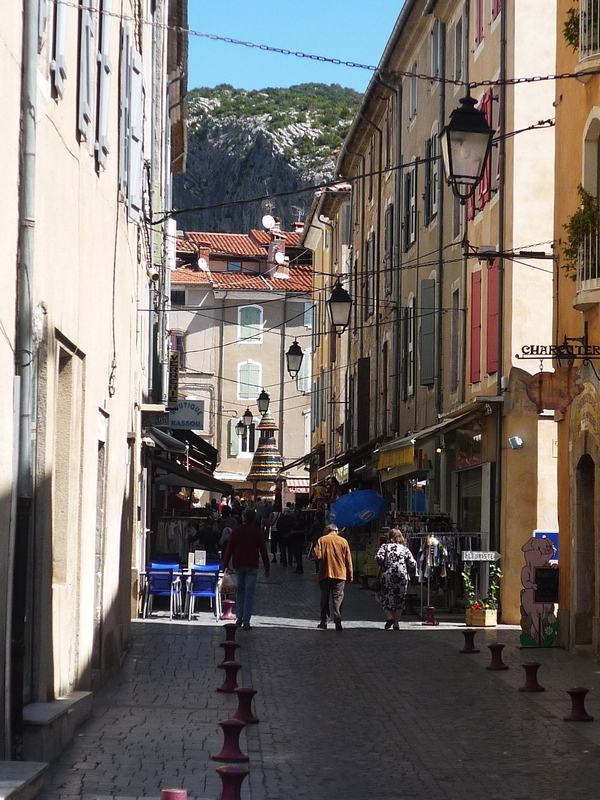 I made my way into the beginning of the Cévennes mountains, but I must have been working too hard because no photographic evidence exists. 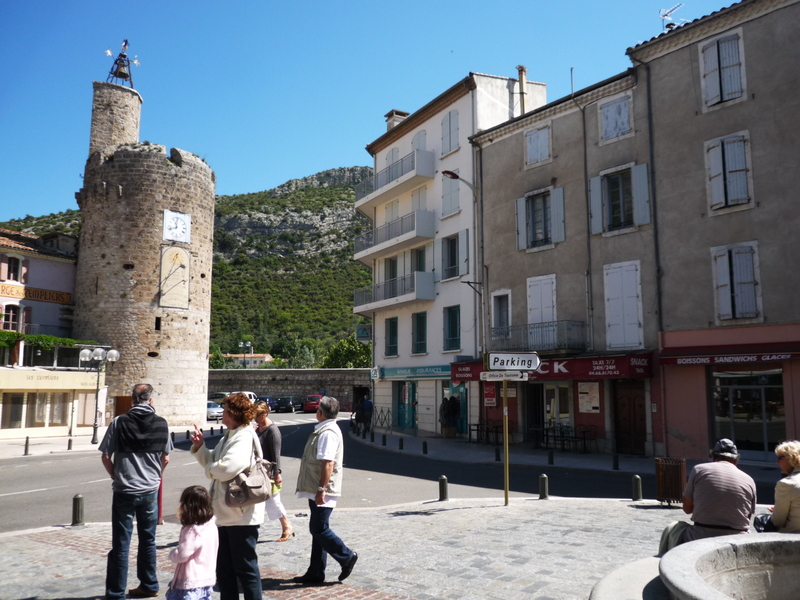 This is as close as I can come – on my way out of the mountains I stopped in Anduze, ‘The Gateway to the Cévennes’, where I turned back south. 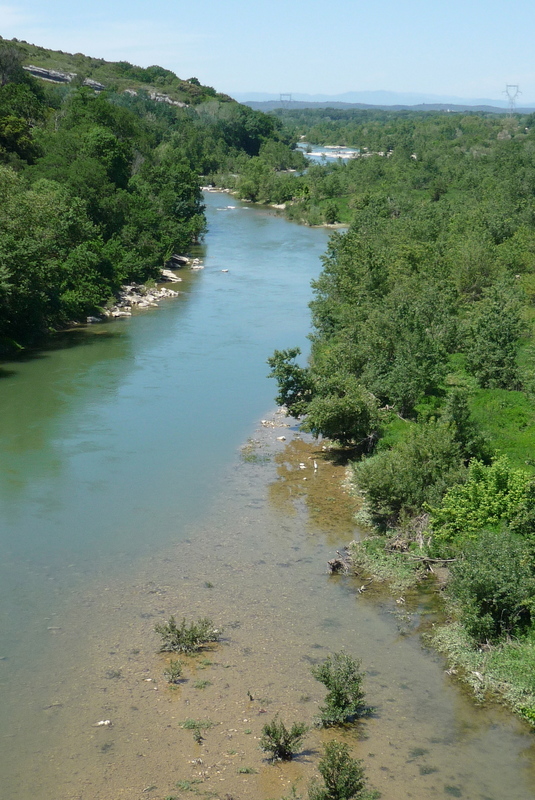 And one last shot of the Gardon River, just before climbing the little mountain behind Nimes. Far in the distance you can just make out the Cévennes, where the wind had blown me back from in time to catch the end of the day’s Giro d’Italia stage. More on this later, if our Canuck in Pink survives a few more days! 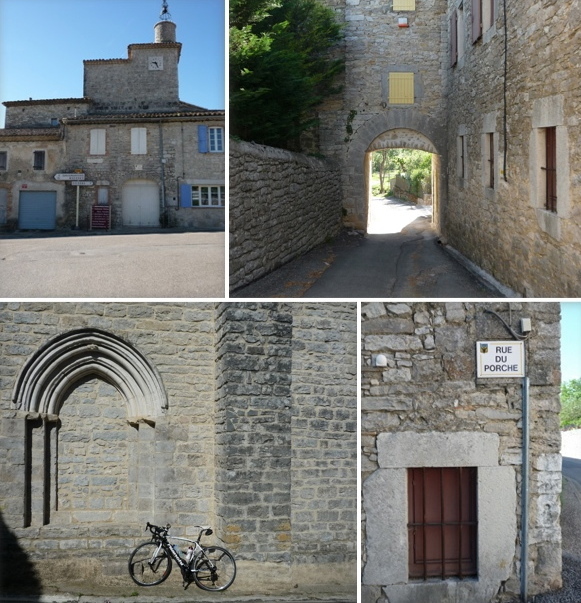 This entry was posted in Cycling and tagged anduze, logrian-florian, nimes-vigan voie verte. Bookmark the permalink. I’ll trade you for your legs, Roan..
Definitely sans Belgian drivers. The Scenery doesn’t hurt either, you’re right. There’s something to be said for riding around and taking pictures, especially with views like that. There’s definitely something to be said, and that speed is my natural way I think. Still, riding to race has its own benefits – just not for good photos.. So you are within 75K or so of Anduze. Double good on you! And speaking of smelling flowers, are those poppies blooming? And the jasmine? Oh, and how many 100K a week are you going to ride, I can’t wait to see where you go. Great photos, thanks! 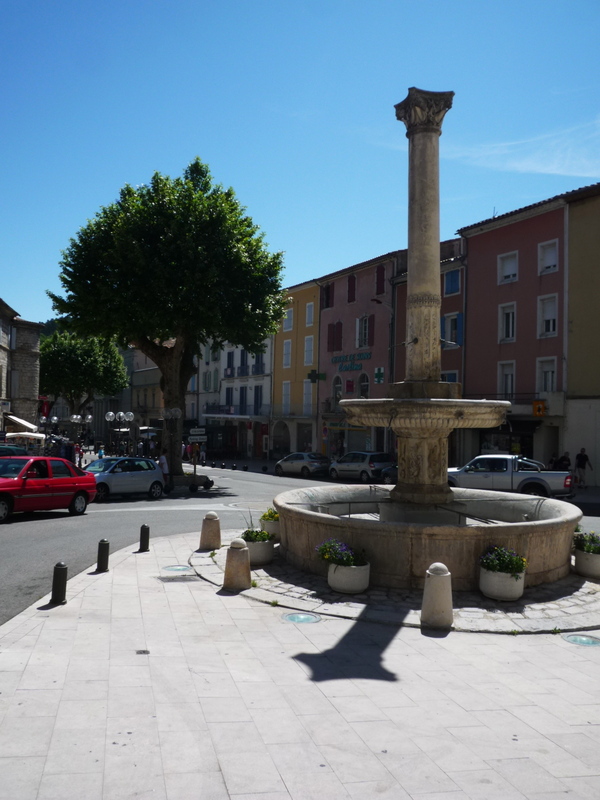 I think Anduze is only about 40km in a straight line (the straight line I did on the way back). And yes, good catch! 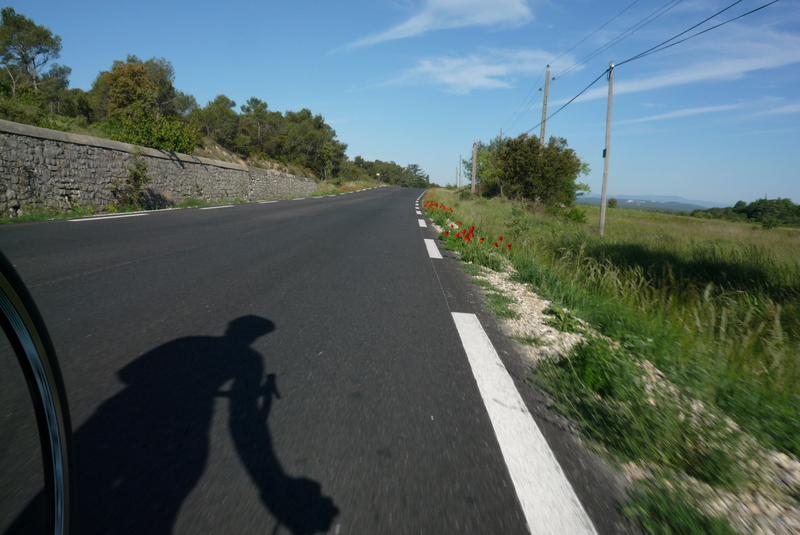 I was actually trying to get the poppy-line road in that photo, but I think I was a bit too quick. Jasmine? Might be. I didn’t smell anything jamine-y, though. Definitely a “throw back post,” and I for one and happy for it. Keep up the great action shots – I think they look great! It’s thanks to you that I occasionally take my life in my own hands with those acrobatic shots, Steve! I’ll get it right one of these days. I plan to do more ‘exploratory’ rides after the Etapes are done with. Need to widen my territory a little.